This review covers the core game, which — arguably — may not be considered the “core” game. Everyone loves a Mario game. Polish, charm, fun. Mario games are a barometer of execution for each of Nintendo’s console generations. Where they don’t push boundaries of graphical fidelity or online community, they shape design language, innovation, and soul within the confines of a familiar world. For the Switch, the promise of a high-fidelity, 3D, sandbox Mario game akin to Super Mario 64 has whetted the appetite for many a fan since its reveal in January 2017. It’s big. It’s beautiful. It’s Mario. It’s everywhere. Odyssey feels like the perfect amalgam of all 3D Mario adventures: The playground of Super Mario 64‘s introductory courtyard, Super Mario Sunshine‘s NPCs, Super Mario Galaxy‘s inventiveness, and Super Mario 3D World‘s fidelity. Above all, there is a “weird” factor that has been generating buzz. The various worlds Mario can travel to feature a variety of art styles: the playable New Donk City feels like a Tony Hawk’s Pro Skater / Sims hybrid while the Sand Kingdom felt like a traditional 3D Mario world with a new classic 2D side-scrolling mechanic added to the mix. (Think The Legend of Zelda: A Link Between Worlds.) The game played as great as you can imagine, but the real allure is looking forward to the variety and trying to figure out just what the hell is going on! It’s this last (emphasized) phrase that I’m struggling with. At E3, I thought I was playing a sample of the complete game. I was sure there was something in the game that would tie the experience and aesthetic of the kingdoms together. Unfortunately, the worlds feel as disconnected as my preview experience. Even for a franchise about an (ex-)plumber in a fantasy land inhabited by mushrooms and turtles, the story is bonkers. A captured Princess Peach is being forcibly wed to Bowser. Bowser is on a quest to find wedding hallmarks (a ring, a cake, etc.) while his wedding-planning henchmen, the Broodals, stave off Mario. The player is thrown into this storyline via an opening cinematic: Mario plunges to his doom from Bowser’s airship, his iconic hat shredded to bits in the blades of the airship’s motor. Wake to find Mario in a strange, noir themed world and introduced to his new sidekick Cappy. Then, the player is off on an adventure to stop Bowser. From the start, something feels off. It’s disorienting not to kick off in Mushroom Kingdom, solely as a frame of reference. As Mario progresses from kingdom to kingdom, it’s not clear how these aesthetically diverse worlds fit into the once familiar Mario universe. While that’s likely the point, they never quite feel like “Mario”. To progress from world to world, the player is expected to collect a certain number of Power Moons to power Mario’s airship. While there is a clear target of power moons to collect, it’s never clear if the player should collect as many as possible now or if there will be an opportunity to collect later. I’m not a completionist. If anything, I’ll blaze through a game as quickly as I can to relate to the zeitgeist. The idea that Super Mario Odyssey rests on the principle of collection is — dare I say — infuriating. Sure, collection is a core tenant of Super Mario 64. However, its hook comes from a limited but achievable set of 120 Power Stars as rewards for solving puzzles and riddles within the game’s 15 stages. However, Super Mario Odyssey falls “short” due to abundance — 999 Power Moons spread across a like 15 stages. It quickly becomes apparent that collecting is the name of this game. Beyond power moons, there are outfits and airship decor to purchase with two types of coin — gold coins as generic, globally accepted currency; purple coins as world specific currency. Purchasable items match the flavor of coin. Outfits purchasable with gold coins are easier to obtain and can be purchased anywhere in the game, while those only purchasable with purple coins require the player to search each world high and low for every specialty coin. Outfits and decorations provide no value outside of aesthetic, but the idea of collecting them sinks its hooks in nonetheless. As for the airship decor, I was not clear what it was initially. In fact, I hadn’t purchased my first one until New Donk City. Ah, New Donk City — Mario’s foray into a world populated by actual humans(?) It’s as wild as it sounds, but somehow, it is the most comfortable of the kingdoms the player visits. As mentioned above, the Tony Hawk / Sims vibe makes this concrete jungle surprisingly welcoming. So much so that I found myself trying to complete every little task in the world before moving on — something I hadn’t tried in worlds previous and quickly dropped afterward. It wasn’t until New Donk City — 8 kingdoms in — that I felt like I understood the game on an objective level. While it’s difficult to put my finger on what felt different, I understood objectively what needed to be done, how to do it, and what to look for. New Donk City feels as welcoming as Super Mario 64‘s courtyard. It provides the opportunity, aesthetic, and space to mess around; to get comfortable. I can’t help but feel New Donk City should have been the first full world in which Mario travels. By wholehearted breaking the art style of Mario games past, it communicates that Mario isn’t in Kansas any more — things are going to get weird. But, it’s a safe space. The platforming opportunities abound go a long way to bridge Mario games of yore into Odyssey and get the player comfortable with the mechanics and core controls. It is the prize of Super Mario Odyssey. Until New Donk City, I felt like I was tip-toeing throughout the game, afraid to miss something important. Something wasn’t clicking, which is a sour experience for a Mario game. At it’s core, Super Mario Odyssey is awful about communication. It does not communicate what’s necessary, what’s optional, and of the optional, what is what. After a week away from the game, New Donk City is what I keep coming back to. I only wish New Donk City was larger. It’s a wonderful playground and an iconic area players will remember. My only hope is that Super Mario Odyssey — like Captain Toad: Treasure Tracker — is an expansion of what we know of the Mushroom Kingdom, or at least the universe in which it inhabits. I hope this is a taste of what’s to come for the Mario franchise — the characters and worlds introduced — or else what’s the point? It is hard to find — these days — a game where “progression” is not a large aspect of it. At least in the games that I find myself playing a lot. Almost every game has some sort of in-built role-playing system where you’re getting better, you’re getting more powerful, you’re collecting more items, you’re collecting more Pokémon — you’re building a stable of those — you know. There’s a sense of progression. For me, I weirdly felt myself not incentivized to play more Mario. Like, I enjoy my time with it, but I don’t find myself… hooked. And I think it is because of that — because you can hunt down a bunch of moons in an individual level. But in the end, I don’t feel stronger or that I’ve accomplished more, necessarily. Super Mario Odyssey is beautiful, charming, and expertly crafted — possibly the most polished and well designed game I’ve ever played. But the desire to jump back in never took hold. Beyond New Donk City, I wasn’t particularly enchanted by any of the other worlds and found myself rushing through the game. That said, mid-way through, I’d begun hearing whispers of something amazing waiting at the end of the game. Truth be told, the end delivered. All of the charm and soul I had been waiting for came to a head. A smile spread across my face — the same smile I imbued upon booting up this new Mario adventure for the first time. I only wish that smile had maintained throughout my experience with Super Mario Odyssey. A traditional game is a challenge in which a player’s skill comes up again a rigid set of rules. Turn-based strategy, multiplayer death match, platformers—these are traditional. The modern, high-end, blockbuster AAA game is not a skill challenge. If it were, the player might fail and be disappointed, and then we wouldn’t sell as many copies. The rules are fluid. We change them to create tension, surprise, or excitement. Saying yes to the player only goes so far, and that distance is the exact length required to make you feel in control. Last week, a colleague of mine asked how far I was into Mario + Rabbids: Kingdom Battle. I told him that I was in the middle of the fourth (and possibly last) stage — Lava Pit. (For what it’s worth, I had recommended the game to him.) I also told him that playing Mario + Rabbids: Kingdom Battle was the most fun I’d had with a video game in a long time. The Legend of Zelda: Breath of the Wild was great, but the aesthetic doesn’t draw me back. Likewise, Splatoon 2 is lots of fun, but only in casual, Mario Kart-style doses. Mario + Rabbids: Kingdom Battlle has me not only progressing through the main campaign, but backtracking to achieve better, cleaner results in previous battles and optional challenges. Right now, it seems the “traditional” game is where I find fulfillment. When life feels like a maze, solving simple, zero-stakes problems — in a world you adore — is unbelievably gratifying. If platformers fit into this bucket, then boy, oh boy am I looking forward to Super Mario Odyssey. Mario + Rabbids Kingdom Battle is the game I’m most looking forward to. It’s gorgeous and surprisingly deep. I can’t recall ever seeing the Mushroom Kingdom in such detail. I waited two hours to play 16 minutes of Mario + Rabbids Kingdom Battle at E3. Madness. But as crazy it was, the immaculate detail of the game’s Mushroom Kingdom saved me from feeling it was a complete waste of time. Simply stunning. Ben Silverman: I think the problem wasn’t that there were fans there, I just think that no one was prepared for this. The management of the [Los Angeles Convention Center] didn’t route people in ways that made sense. It was just like everyone go and charge through these gigantic halls. The booths weren’t set up to handle that crush of fans. On the first night — Tuesday night — Nintendo furiously reorganized their booth so that Wednesday and Thursday it would make more sense. Jeff Cannata: And kudos to them because they did a great job. Tuesday it was literally just a sea of people at the Nintendo booth. It was unmanageable, completely. And kudos to them for staying up late that night and figuring it out. They had structure that really worked for the rest of the show. I mean, it was a six hour line — I wouldn’t wish that on my worst enemy — but it still at least allowed movement through their booth. My friend and I took note of Nintendo’s queue management restructure on Wednesday as well. It was very cool to see. However, the lines for Super Mario Odyssey remained completely insane, but at least there were lines. I mentioned that my friend and I lucked out in playing Super Mario Odyssey. Wednesday morning, after being let into the LACC, we beelined it for Super Mario Odyssey, but were discouraged to find that the line was already three hours long. A Nintendo booth actor/temp — dressed in a New Donk City themed suit and fedora no less — whispered “a secret” that the attendees sitting on a bench behind us with Switches in handheld mode were actually partaking in the demo. To a passerby, they looked like attendees playing on their own consoles. We were none the wiser until the fedora-clad “Donkian” gave us the coat full of contraband treatment. (I don’t think he was in character, but it fit the bill.) We immediately formed a line next to the bench, sparking another lengthy queue. In all fairness, the actor/temp should have informed those waiting in the longer line that the Switches on the bench were demo units as well, long before my friend and I arrived. On the flip side, the lengthy Super Mario Odyssey line was a for a docked Switch with headphones — the full console experience. The bench Switches were portable mode only and did not feature audio, one of my favorite elements of Mario games. On Friday, January 13 at 1 PM Japan Standard Time, Nintendo unveiled new details about their Switch “home” console. While hard tech specs didn’t make an appearance — I thought for sure Nvidia would have been showcased — deeper insight to the Joy-Con, play styles, and 2017 library were provided. Above all, what the keynote will be remembered for is an awkward Squid Researcher. Nintendo Switch will launch in “Japan, US, Canada, major European countries, Hong Kong, and other territories” on March 3rd. It will retail in Japan for ¥29,980, the US for $299.99, and varying prices in the European territories. Software will not be region locked, which is an incredibly big move for Nintendo. Pre-orders for the Switch went up after the event and appear too have quickly depleted. As a whole, the presentation felt backwards and tonally awkward. Without building any hype, Nintendo opened with launch dates and pricing. The Joy-Con demonstration as well as the trailers for first-party titles 1-2-Switch and Arms felt long-in-the-tooth. At least two of the presenters garnered “WTF” moments that also seemed to throw off one of the translators. And then there was Hisashi Nogami’s Splatoon 2 appearance as a “Squid Researcher”. Nintendo makes cute games and they’ve done cute things during presentations, but they’ve never struck me as outlandishly awkward. The Splatoon 2 portion sapped the presentation of its professionalism, which feels odd to say as it’s a game about squid children shooting paint at one another. At it’s core, Switch is a toy. But it’s audience doesn’t treat it that way. Nintendo is a global company. It has been since the Wii, and certainly before that to its core, 30-somethings audience. Even for the crazy toymaker, there has been something professional about their presentations, marketing, and — since the Wii — industrial design. The latter of which is present in the Switch. The system’s design is as plain as ever and comes in stark contrast to a squirt-gun wielding executive taking the stage. Within 30 seconds, Nintendo hammered on the idea that Switch is built for the home. It felted pointed and explicit. It’s an important point. The Switch is intended to be the dream: a home console you can take with you. On the point of battery life, Nintendo claims that the Switch will have two-and-a-half to six hours of battery life when in a portable mode. Studies show that 3 or more hours of gaming can being to have negative psychosocial effects. The Switch will also offer 8-person local multiplayer in portable mode. Depending on adoption, this could be a killer feature. The capability alone screams that Nintendo is gunning for a new generation of portable gaming. The HD Rumble demonstration claimed that the sensation of a glass with one, two, or three ice cubes rattling as well as the glass filling up with water could be felt in a single Joy-Con. The best I could figure was that HD rumble include three independent rumble motors, allowing for altered effects. It’s worth noting that when the Joy-Con are separated from the Switch itself, the right Joy-Con features a joystick in its center. I can’t imagine this feels great. I guess I’ll leave it up to a company that shipped a controller with an analog joystick in its center to make that call. We’ve known about The Legend of Zelda: Breath of the Wild since 2013. And the October 2016 announcement of Nintendo Switch teased a new 3D Mario game. Two staples we, without a doubt, knew we were getting. Even Skyrim was a fairly sure certainty for the platform. The equivalent of Wii Sports for Wii and and Nintendo Land for Wii U, 1-2-Switch is Switch’s tutorial game. It looks extremely awkward, but I’ll blame that on the all to lengthy Mexican standoff demonstration. For better or worse, it was a solid reminder that Nintendo is a toy company. Interestingly, Nintendo introduced a first-party fighter. But not just any fighter. In true Nintendo fashion, Arms is also a shooter of sorts. A fighter-shooter hybrid labeled as a “Fighting sports game.” It looks like it might even be fun without motion controls. Like other Nintendo franchises before it, it appears to feature a cast of (possibly) memorable characters such as Spring Man and Ribbon Girl. Will Arms be the next Wii boxing or Splatoon? What do you think of the name? While Wii Remotes (how did they not go with “Wiimotes”?!) were available for Wii U, Switch seems like a much more natural fit for Splatoon. As far as motion control shooters go, I loved the feel of Metroid Prime 3 on Wii. It’s also nice to see Nintendo doubling-down on this new franchise. Mario is out of the Mushroom Kingdom, and seeming into the real-world. At least for some portion of the game. Super Mario Odyssey is meant to evoke “the excitement when visiting unknown countries for the very first time.” The visuals look incredible, relying heavily on shadows and environmental physics. This is in contrast to another visually impressive Mario game — Super Mario Galaxy, which used an opposite lighting effect on Mario, providing a white shine around his model. While the visuals and openness of Super Mario Odyssey look sunning, there is something discomforting about seeing the cartoonish Mario next to Sim-ish humanoids. I’m most looking forward to this game. Boy, oh boy, does this game look great! Next-level Paper Mario meets Retro Final Fantasy? It’s titles like this that make me excited for the portability of the Switch. Something about retro stylings screams “personal” and “portable” to me. I’ve been itching for a portable version of Skyrim since I tried playing on Xbox 360. Skyrim is a game to get lost in; to spend hours with. But to spend hours taking over the TV in our house would be unconscionable. Needless to say, I never got more than three hours into this game on Xbox 360. I’m very much looking forward finally working through this game on my own portable screen. There was a brief clip of a Street Fighter game during the final Switch video. Like others, I immediately thought we’d seen a glimpse of the Virtual Console on Switch. Alas, it appears to be a standalone version of Ultra Street Fighter II: The Final Challengers. I kept wondering if the glimpses of Mario Kart throughout the presentation were a new Mario Kart game. But they appeared too similar to Mario Kart 8. I don’t have much to say about Super Bomberman R. I was never a huge fan of the Bomberman series. I do recall playing a ton of Blaster Master Jr. on Game Boy. I mainly wanted call out my nostalgia and affection for Bomberman 64. Breath of the Wild is a Switch launch title. Nintendo presented this as huge news, but it comes off more as a confirmation to quell fan fears. Beyond that, not too many additional details were given. The new, extended trailer showed off the breadth of the open Hyrule as well as new and familiar characters. And while cartoony, the tone of the narrative seemed fairly adult. Without question, Switch is another unique and possibly industry changing device. Like Apple, Nintendo often skates to where the puck is headed, defining industry trends. And without question, the biggest dream of all is being able to take your home console on the go. 1I am so thrilled that USB-C seems to be taking off like it is. Within months of Apple going whole hog on their MacBook and MacBook Pro lines, I’ve purchased a Drobo 5C and ROLI Lightpad Block that are also equipped with USB-C. Now I’ll be able to add Nintendo Switch to the mix. I imagine this interview was filmed during Miyamoto’s monstrous press tour for Super Mario Run. Love the inclusion of beautiful animations and archival footage by Vox’s team. For more on the design of World 1-1, watch Dan Emmons’ breakdown ‘Level 1-1 – How Super Mario Mastered Level Design‘. For more about the business side of Nintendo, read ‘Console Wars‘ by Blake J. Harris. For more about his characters and Super Mario Run, watch/listen to Miyamoto’s interview with Katie Linendoll at Apple SoHo. 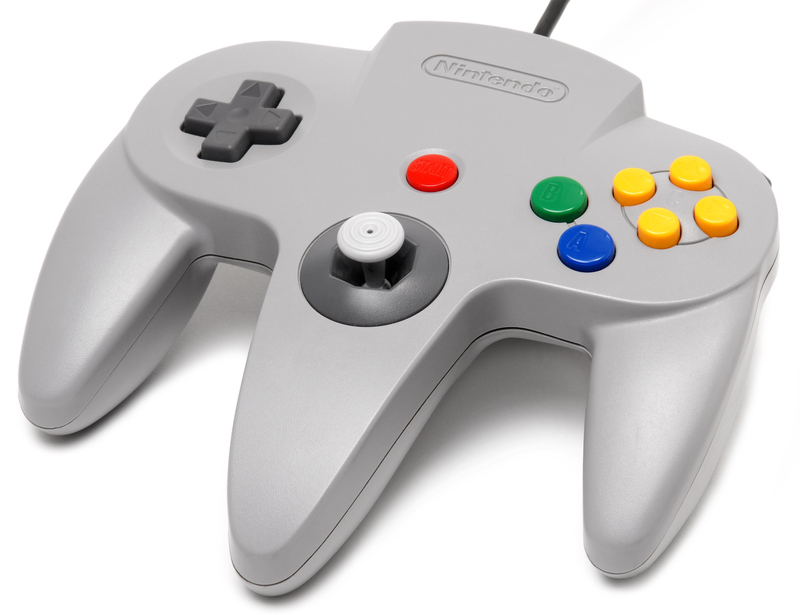 Perhaps most notably, this was the last console on which Nintendo could rehash its older characters and series without fielding non-stop complaints about “sequelitis.” The console’s best first-party games were mostly sequels—Super Mario 64, Ocarina of Time, Mario Kart 64, Star Fox 64, F-Zero X, even Wave Race 64 and Excitebike 64—and yet all of them felt incredibly new thanks to their steps up to fully 3D engines. Nintendo had been a purely 2D game-making company for nearly a decade, yet it somehow pulled off the transition to 3D gaming in pretty much every way that Sega flubbed its own total overhaul. If the doomsayers are correct and Nintendo’s failure is eminent, redesigns are going to be required to prevent it. So far, the majority of first-party titles on Wii U are iterative: Mario Kart 8, Super Smash Bros. Wii U, Super Mario 3D World, Pikmin 3, Donkey Kong: Tropical Freeze. While not every redesign has worked in Nintendo’s favor (I’m looking at you, Captain Toad: Treasure Tracker is genius; while it’s not a new take on a old classic (because there is no old classic! ), it’s a new perspective from the Mushroom Kingdom. Until then, it’s back to smashing and karting. Pokémon Go was the most recent example of a redesigned rather than iterative experience. Real-world Pokémon is an experience many fans have yearned for since the days of Red and Blue (or Green). Nintendo’s decision to make Niantic, Inc.’s Ingress a venue for real-world Pokémon was not only brilliant, but for a company that’s built their namesake on changing our perspectives, hidden-in-plain-sight. With surprise experiences like Pokémon Go and Nintendo’s further foray into the new terrian of smartphone hardware, we are sure to see at least a handful of redesigned experiences on mobile. With the NX, my hopes are not so high. But if anyone can reimagine the console experience, it’s Nintendo. I’ve been playing a lot more Mario Kart 8 lately and recently played through Moo Moo Meadows. My wife loves this course. It is simple and old, recently made beautiful. Maybe it’s the lighting, but I get a similar vibe from Moo Moo Meadows as I do Wild Woods. Call me crazy, but I’m doubling down on the direction of the next 3D Mario.